Selecting polyline between two point features using ModelBuilder? I am looking to select a segment of a polyline that is between two GPS points in ModelBuilder. The line segment is created by enabling a user to define his/hers begin end point, and then using the split line at point tool to split out the appropriate line segment. I am struggling to find a way to select this newly defined segment once I get to this point. I would like to select and export this segment out so I can run further analysis for the user. Does anyone have a solution that can be shared? The model works by adding XY to GPS points, splits line at GPS points and then uses add geometry tool to add start and end coordinates. For both of these datasets the XY values are converted to a string and concatenated into a single text, eg. "100,200". The split line has a startxy and endxy. The GPS data is copied into in_memory and then the in_memory and original gps data are joined back to the split line. One join to startxy the other to endxy. The resulting combination of joins identifies that line because it is the only line where its joined data for start and end are not null. I've suggested this approach as this is the path you have started down. A completely alternative approach is to use linear referencing, where you convert your line to a measured route, then you locate your gps points as events then you build linear route events along the route. This takes less steps, probably quicker but relies on you understanding what a measured (polylineM) dataset is and how to handle it, that's all in the help file. Not the answer you're looking for? Browse other questions tagged arcgis-desktop modelbuilder select or ask your own question. 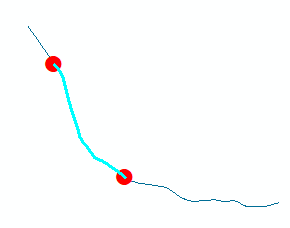 Finding distance of point along polyline using ArcGIS Desktop? Manually splitting polyline into two parts at specific vertex? Creating network from GPS tracks? Distance between points along polyline ArcGIS for Desktop? Geocoding Street Segments Based on Extents in ArcGIS for Desktop? Transforming GPS tracks to line segments, and retaining start_time and end_time? Selecting distance-based features using ArcGIS ModelBuilder?